While the labor movement is in some of its more dire straits in over a century, 2015 is also shaping up to be a big year for unions. The “Fight for $15” strikes held in over 200 cities on April 15 indicate that a mass movement for worker justice may be on the verge of exploding, one that blends the best of organized labor, community organizing, Occupy Wall Street and #BlackLivesMatter. Oil workers, truck drivers, and dockworkers also went on widely publicized, confrontational strikes this year, and LA teachers at both public and charter schools are preparing to take action on the job, as are graduate students at the University of Washington and several other campuses. Today, May 1, a Bay Area local of the International Longshore and Warehouse Union shut down its ports to protest the racism and police brutality against black and brown people, providing a classic example of what “social movement unionism” looks like in practice. Unions are also fighting hard to block looming pension cuts and derail fast track for the Trans-Pacific Partnership trade agreement. But labor’s “Right to Work” defeat in Wisconsin in March was a huge setback, while the results of the April 7 Chicago mayor’s race were mixed, at best. Taken as a whole, the small upsurge in labor unrest in recent months has not been enough to slow down, much less stop and reverse, the steep historical decline of the trade union movement. Given all this, labor needs to take serious stock of the current populist moment, analyze which strategies are actually working and which are not, and start to consider what it’s really going to take to change course and rebuild a fighting workers movement from the ground up. Dumping hundreds of millions of dollars down the rabbit-hole of Democratic Party electoral politics during the next presidential election cycle is unlikely to get the job done. 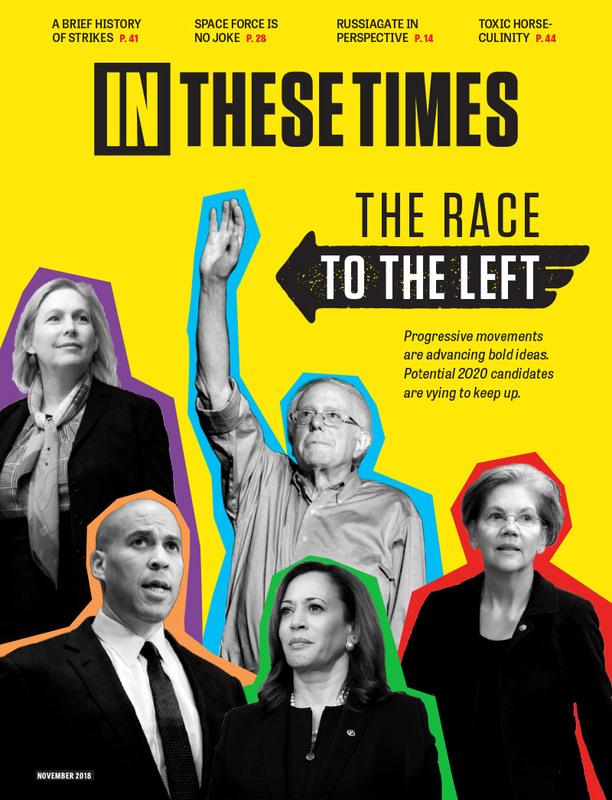 In the long run, labor would be better off scaling back its electoral work and instead double down on new and internal organizing, with a special emphasis on bringing back the widespread and prolific use of the strike—a weapon that, unlike the campaign contribution, actually has the power to change the political calculus on the job and in Washington. Popularizing the use of the strike as a tactic again (which in some ways is already happening, just not widely enough or quickly enough) could not only lead to more victories on the job; it could also help grow the confidence of the working class as a whole to take on bigger political challenges and see the value in joining mass movements for transformational social change. Unions should start making this transition now and use the rest of the year to accomplish an ambitious goal to train its members, in every bargaining unit across the country, in how to organize and implement a successful strike campaign. Organized workers going on strike to win better wages, hours and working conditions may sound like common sense—“bread and butter” unionism. But decades of sustained defeats at the hands of corporate power—combined with the dominant business unionism model that eschews worker militancy, shop floor struggle and open confrontation in favor of backroom deal-making and so-called “labor-management partnerships”—has created an environment where all too many labor unions have forgotten their true source of power and how to effectively use it. Luckily, a group of innovative democratic union reformers at SEIU Local 1021 in California have developed a new training curriculum called the Strike School that could serve as a nationwide model for action and be easily adapted to fit local needs by action committees made up of union stewards, shop floor leaders, rank and file workers and organizing staff. Local 1021’s model Strike School, which In These Times has obtained and posted online (links below) as an open source document, is designed to educate workers about the true nature of class politics and class conflict, the power of the strike, how to organize and win a strike and how to use the strike as part of a larger social movement. It is divided into three modules: “Economic Power,” “Striking for Our Communities,” and “Strategic Planning,” and uses the 1937 sit-down strike in Flint, Michigan, as well as the 2012 Port of Oakland and Chicago Teachers strikes as case studies. PowerPoints, video documentaries, guided discussions, mock scenarios and worker role-plays are all part of the curriculum. “We took office just as austerity was hitting in the aftermath of the Great Recession, and the employers had a strategy of imposition,” said Larry Bradshaw, a rank-and-file paramedic who joined a bottom-up slate calling for democratic union reform and is now a Vice President at Local 1021. According to Bradshaw, more than 1,000 workers in California have completed the Strike School training, and several bargaining units have gone on strike—and won. “Always assume negotiations will break down and that your bargaining unit will be forced to go on strike, then work backwards from there to figure out how,” Bradshaw said. Of course, decades of hostile labor laws and court precedents have made going on strike a lot easier said than done, and labor will need to be ready to commit civil disobedience and start going on brazenly illegal strikes, in open defiance of the law when necessary, and either refuse to pay the corresponding fines and penalties or pony up the money from its election campaign coffers instead. Labor also needs to continue to build strategic alliances with other social movement actors fighting austerity and racial injustice. The intersection of the Fight for $15 and #BlackLivesMatter is an important start. Imagine if a tidal wave of worker strikes for economic and social justice began to rock job sites across the country in the months and years to come. Such strikes, as part of a shift to more militant and community-minded action, could help shake the labor movement from its current beaten-down stupor. NUW members in Australia have responded to attempted lockouts with lunchroom occupations designed to shut the plants down and prevent anything from coming in or out. First at Smiths Chips in Tingalpa, then at International Flavours and Fragrances in Dandenong. Put that on every billboard all the way across the country. And how do the labor leaders get to be labor leadership? They are voted in. They can be voted out. Whether Labor prepares or not, the right wing is going to try to take them down. They had best be prepared. Great thought! Had a good time reading this article. Keep sharing! Huh. Congratulations, then: you're apparently one that it's aimed at. Hey this is a really great article, but the "strike school" modules are incomplete- they are missing all the videos! Is there any chance we could figure out a way to get a hold of them? This "Fight for $15" nonsense is a load of bull squeeze aimed at lazy, angry people who don't understand economics. Union members already know how to fight and struggle. It is union leadership that needs to stop being complacent and pragmatic. I think we really need to support union members caught in a lockout. The lock out seems to be the current tactic of choice among many corporations right now. Solidarity calls for confronting it head on, nation wide if necessary.